December's update brings you three popular Buchschmid and Gretaux wood inlay subjects. You may have seen these before, but the examples shown here with our December update are other examples of those favorite subjects. It is useful to compare these to the other pieces of the same title which you will find in our other "B & G" pages. Our December update brings you three new examples of some of the most popular Buchschmid and Gretaux wood inlay pictures. 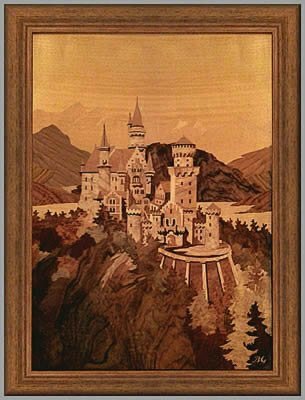 The first one is the beautiful Neuschwanstein Castle - the real life stuff of fairytales. The owner of this lovely picture Charles (Chuck) Fagan, tells us that the BG logo on his picture is located in the lower right corner, whereas our example on page 3 of this series is located in the lower left hand corner. We checked this out and found that Chuck is absolutely right, it is in the lower left hand corner of our earlier example! 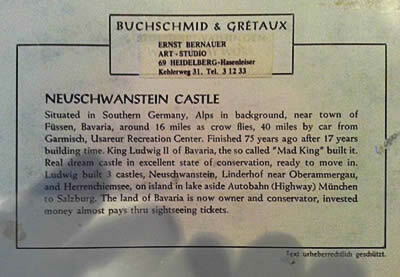 This is obviously a popular subject from the Buchschmid and Gretaux catalogue and a goodly number of this subject must have been produced. Unfortunately with the passing of Otto Chlup we lost all reference to production quantities of certain subjects, so we must assume the amounts of certain subjects from the amount of feedback we get from you our web visitors. 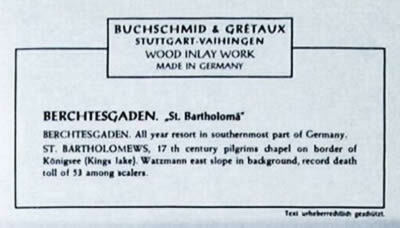 One thing we are sure of is that most of the Buchschmid and Gretaux wood inlay works were produced in batches of ten. This was limited by their packet cutting methods which would physically limit the veneer packs to a maximum of ten pieces of veneer per pack. There were 'one offs' of certain subjects, but these were rare special orders. 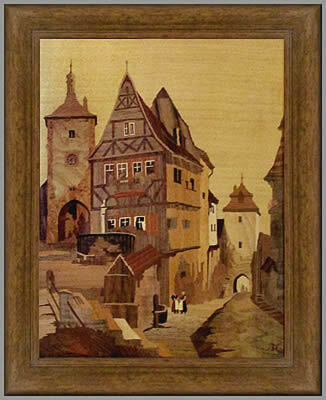 The next two Buchschmid and Gretaux Wood Inlay pieces which are Rothenburg and Berchtesgaden were sent into us by web visitor Eileen Alicea to see if anyone would be interested in purchasing them. Although we do not operate as a broker, seller or intermediate where such sales are concerned, we will on occasions display the pieces on our website and pass any enquiries onto our web visitor so that they can conduct their sale on a one to one basis. Eileen says "I bought them in 1984 in Germany and they were made before that year. 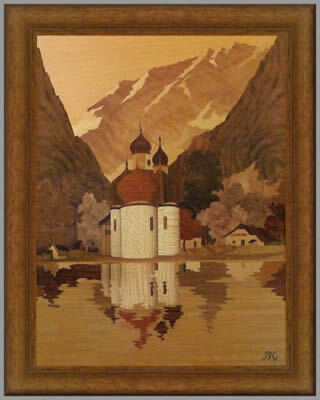 1) Berchtesgaden 13.5 in. x 11 in. 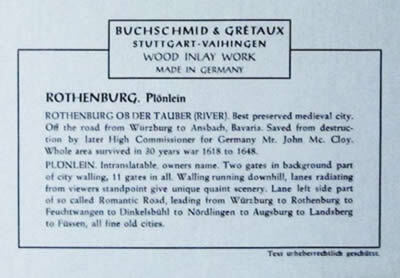 2) Rotenburg 13.5 in. x 11 in. The both have the authentic B & G signature. They have only been displayed for a few months altogether and are in pristine condition with no cracks." If you are interested please contact us and we will pass your details on to Eileen who will contact you personally. Click the above button to return to page 50 of "Can You Help"